The Razor electric scooter is a favorite for many people. However, one major downfall with it is that most are designed for kids rather than full-size adults. This makes it difficult for people who want to use it as a way to avoid traffic and walking to work each day. 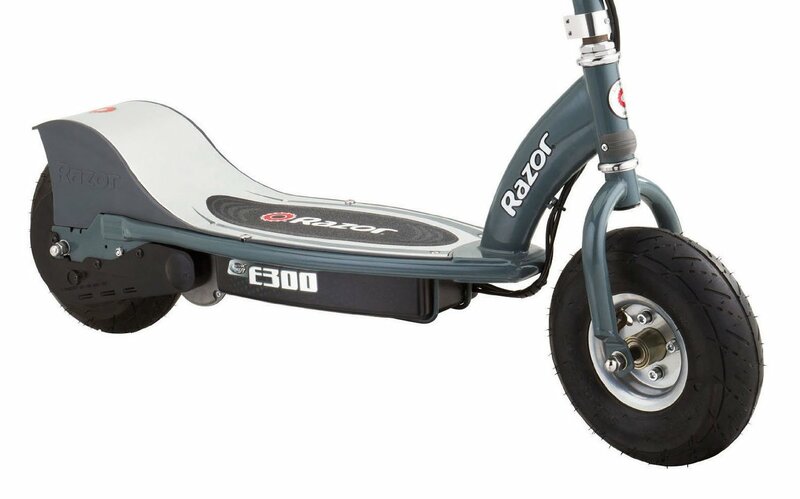 If this sounds ideal to you, perhaps you should check out our Razor E300 electric scooter review to make sure it is a good fit for you or your family. One of the most impressive things about this electric scooter is its' top speed. It is one of the fastest Razors available and will reach speeds of up to 15 mph and it can maintain those speeds for up to 40 minutes of continuous ride time. The motor is a chain driven, high torque style motor. To control it, you twist the acceleration control and then to brake, you use the convenient hand-brake. It does weigh quite a bit at around 53.69 pounds and is larger than other Razors at 41 x 17 x 42 inches. The upside is that with the larger, heavier frame, it can support an adult that is up to 220 pounds. This larger size is supported further by extra-wide 10-inch pneumatic tires. The E300 comes with the basic 90-day Razor warranty. This also protects you if your battery is defective from the date of purchase. It has a super-sized deck which is perfect for adults and kids alike. The larger deck gives more foot room and more stability to the rider. As with all other Razor electric scooters, you will get everything you need with one purchase. This includes two 12V sealed lead acid batteries that are rechargeable, the battery charger, a retractable kickstand, and the tools that you will need to assemble/disassemble. 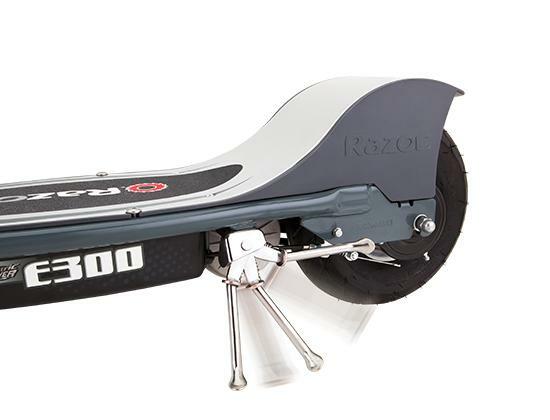 Do Owners Like the Razor E300 Electric Scooter? 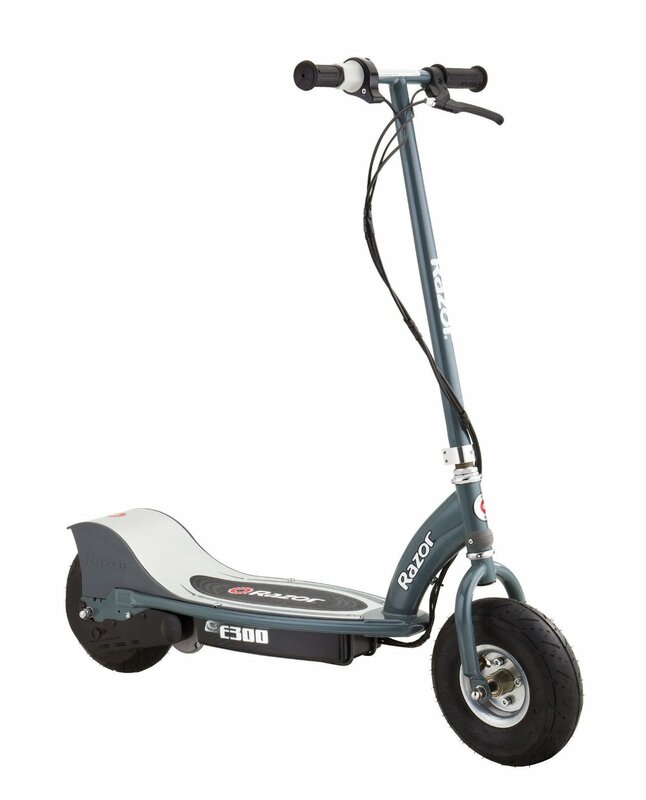 Most of the 470+ voters have given this scooter a 5-star rating. It holds an average rating of 4.2 stars. Within in the very few negative reviews you will find that one person says they didn’t get the 10” tires and that it does not go as fast as it says it will. This could easily be a defect that could be covered by a warranty. Also, there are some who state that the battery will not hold a charge. There are a variety of reasons why a battery may fail and it could be because they did not charge it fully the first time. Overall, most love this scooter. Many owners have owned and used it for more than a year and say that it is still running like new. Some of the main users are kids, but not all. There are even a few senior citizens who also enjoy using this scooter to get around their neighborhoods.